U.S. Senator Mitch McConnell (A&S, 1964; UofL Alumnus of the Year, 1994) chose his alma mater to preserve and eventually make available for research his papers that document his life and career from a student – at duPont Manual High School, the University of Louisville and the University of Kentucky School of Law – to his rise in politics – from U.S. Senator Marlow Cook's legislative aide, to Judge-Executive of Jefferson County, Ky., to his present position as U.S. Senator from Kentucky and Senate Republican Leader. His papers include family correspondence and photographs, campaign records and artifacts and office records in all formats created and maintained by the senator and his staff that reflect the structure and functions of the U.S. Senate and document official, legislative, press and media activities. The records are, and will be, a rich resource providing primary documentary evidence for research on our federal system of government, the link between the Commonwealth of Kentucky and the federal government and people, the balance of power between the branches of the federal government, legislators and legislative issues of regional, state, and national importance, and interactions of Congressional members with each other and representational relationships with constituents. The Archives also manages and preserves the papers of Elaine L. Chao, the United States 24th Secretary of Labor (2001-2009), now a Heritage Foundation Distinguished Fellow. Chao, who became the first Asian American woman to serve in a cabinet-level position, held previous federal positions including Chair of the Federal Maritime Commission, Director of the Peace Corps and Deputy Secretary of the U. S. Department of Transportation. She also served as President and C.E.O. of the United Way of America. "Her personal papers provide a valuable resource on the life on immigrant family, her prolific career as an executive and life in public service and the many activities associated with these positions," Skaggs Speth said. The University of Louisville is proud to preserve the U.S. 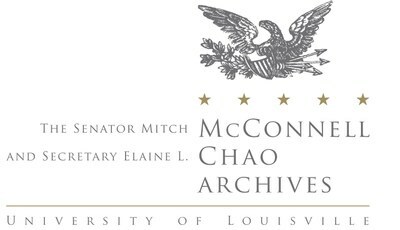 Senator Mitch McConnell and Elaine L. Chao Archives which, when open for research, will offer a wide range of documentary evidence and research value for a large array of users, beyond scholars of history and political science. Their collections contain primary information, in the form of correspondence, reports, speeches, photograph, and videos on legal, economic, and social data on a variety of issues such as energy, the environment, health care, immigration, national defense and transportation.